(1) Please come to the PC data registration reception desk on 4th floor of Asakusa View Hotel and submit your presentation data at least 60 minutes prior to the session. (2) Each oral presenter is required to hand in the presentation file in a USB stick before the session. No personal computers will be allowed. Files must be prepared in Microsoft PowerPoint 2007(.pptx) or higher format using Windows. (3) Your presentation slide must use the following OS standard fonts in order to avoid font problems and unexpected changes of screen layout: MS Gothic, MS PGothic, MS Mincho, MS PMincho, Century and Times New Roman styles. (4) Any data (still images, video, graphs etc.) associated with and linked to the presentation slide, must be saved together with the PowerPoint file in the same folder. (5) The name of the presentation file should be ”presentation number＿the presenter’s name”. (6) The USB device containing the presentation file and data must be checked for any computer malware/viruses using security software running with the most up-to-date virus definitions. (7) Please standby at the presenter’s seat 15 minutes prior to your presentation. (8) Oral presentation time is 10 minutes for each presenter + 3 minutes for Q&A. 8:00 am ~ 13:00 pm, Mon. 11th March, please paste your poster on the specified panel accordance with the poster number. 1) Poster Session Venue: Room Hishou, 4th floor, Akasaka View Hotel Make 1 minute oral presentation by using one slide to describe your poster. *This is not compulsory, but would appreciate your participation. 2) Post Core-Time Venue: In front of your poster. Presenters are required to standby in front of your poster an answer to visitor’s questions. Please remove your own poster from, Wed. 13th March 2019. The poster will be discarded after the above mentioned time. (4) Posters should be designed and constructed with separate 1) title, together with author’s names and affiliations, and 2) main body of the presentation. 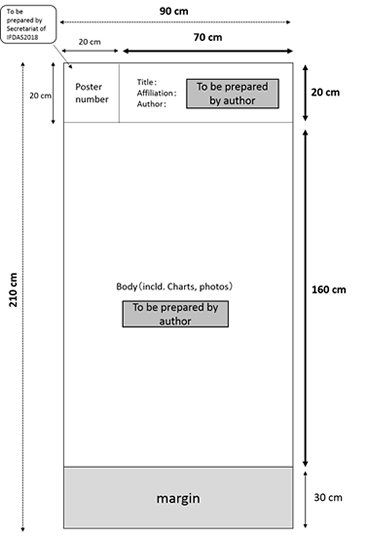 The title section, including the title, author’s names and affiliations, should be prepared on a page with dimension of <70cm (width) x <20cm (height). The main body needs to fit within a space 90cm (width) x 160cm (height). We will prepare the presentation number pages (20cm x 20cm). (1) Please come to the ‘General Information’ desk which located on 4th floor lobby of Asakusa View Hotel, for chairman registration 60 minutes before your session. (2) Standby at the Chair’s seat 15 minutes prior to the session.